I’ve made MANY purchases for the 2010 backpacking season, including significant purchases of gear constructed of cuben fiber. I’ve not yet chronicled a single item thus far, due to the simple reason of not wanting to review anything I haven’t adequately tested . . . in the field. The first purchase that I feel able to properly review is the Marmot Super Mica, an ultralight jacket that I purchased in early February. 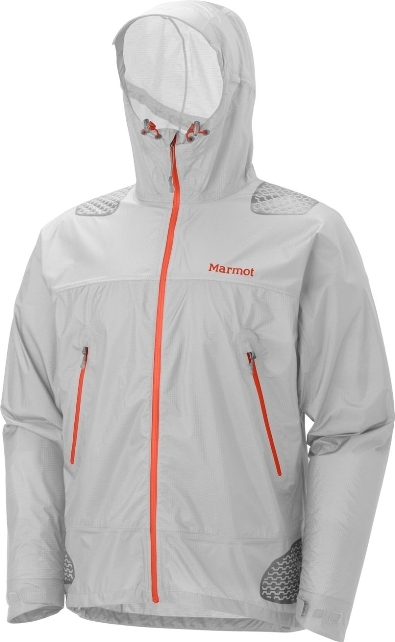 This purchase was intended to fill a void in my UL collection for a full-featured jacket that I could don as both a windshirt and storm-proof jacket given its low stated weight of 9 ounces from the description @ Marmot. Introducing the Marmot Super Mica! The features are a significant upgrade over the prior generation, the Mica, in the areas of an upgraded hood with wire brim, reinforcements on the shoulder strap and hip belt areas, pit zips, and pockets that are placed above the hip belt area (that, I’ll note, also operate as additional vents). I was happy to find, upon throwing this jacket on the scale that it weighed only 8 oz in size medium. At 5’9″and ~165 lbs, the jacket fits me perfectly and is suitable for layering over base and insulation layers as appropriate. This was key for me as I didn’t want too athletic of a fit given my intent to use this as my primary shell for backpacking. 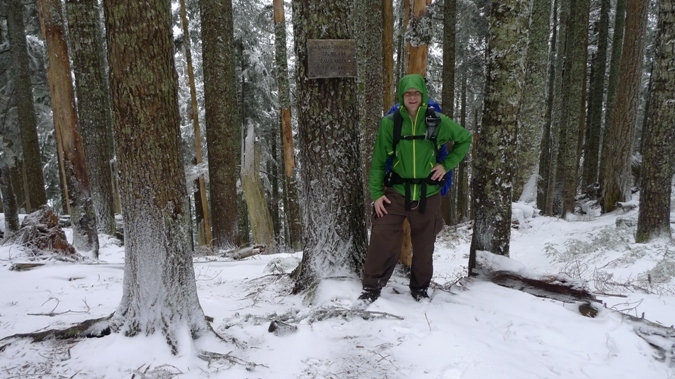 I performed testing of this jacket with 3 separate packs, in myriad weather conditions including torrential downpours, heavy wind, and wind-blown snow, for greater than 60 miles of backpacking. I found the breathability of this jacket to be excellent, other than in my forearms. Given multiple venting options, I was able to address this by loosening the cuff appropriately. I found it to be extremely weatherproof as well, withstanding a multiple hour downpour with nary a drop inside. That said, the cuffs, the only area that isn’t fully seam taped, got pretty wet, but not enough to soak through (and it was raining really, really hard). One of the tests that I performed was to walk through a waterfall in the trail to determine whether any water would penetrate the pack. I’m happy to say that the jacket passed this test with flying colors and other than a cold rush of water between my pack and the jacket, I escaped unscathed! On top of Camp Smokey . . .. This jacket is expensive @ $200, but is extremely light and fully-featured providing a ton of options without a significant weight penalty. 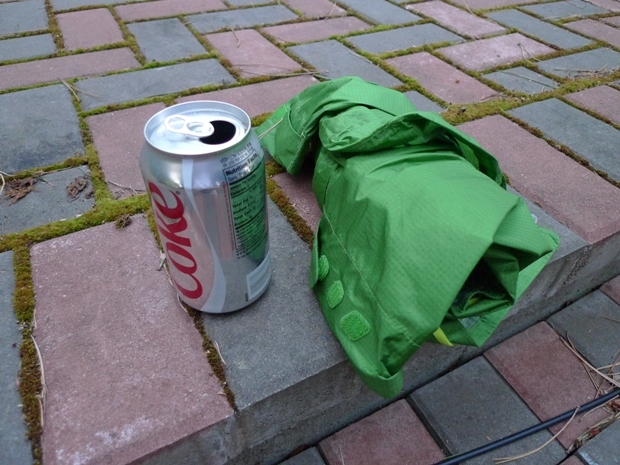 It withstood significant pounding from the elements (rain, sleet, snow, wind) while keeping me completely dry. This provides a level of function that I wouldn’t have with a poncho-tarp combination and is similar weight when combined with a UL tarp (to be reviewed separately). The hood is very adjustable and keeps the elements OUT. The wire brim is flexible enough to be used without a lid or visor. The pockets are easily accessible when using a hip belt. We’ll see how the reinforcements fare over time, but at this point there’s no apparent wear. I’ll plan to perform significant additional testing over the coming months, but at this point, in spite of the number of miles that I’ve put on it, the jacket still looks brand new. EDIT: Given a comment below, I’ve added an additional photo of the Super Mica when loosely rolled up for storage. This entry was posted in Gear Reviews. Bookmark the permalink. Awesome – somebody FINALLY reviewing the Super Mica, rather than cut’n’pasting the promo advice. I have a question and I think you can help – I have been researching jackets online for about a week. My purpose is to get an ideal, breathable, weather-protective waterproof for use as needed during an 18-hour mountain run in the Australian bush. There’s a lot of hill running, I’ll be carrying a 5 kg pack (Nathan – sits up, no waistbelt), it’ll probably drop near freezing at night and it might rain for the whole damn thing or not at all. After a shortlist which included OMM Kamleika, Haglof’s Oz and Ozo, I’m down to a decision between the Rab Demand Pull-On and the Marmot Super Mica. It sounds from this like the Marmot stood up to rough treatment and didn’t disappoint – which is surprising because it does look pretty breakable. The price is a bit up there, but if it fully handles sweaty activity without wetting up more than your wicking layer can handle, and it keeps the elements out, and doesn’t slow you down, that’s pretty sweet. On the other hand, the Rab Demand doesn’t have the venting options, but is fully made of eVent, is a smock which is more naturally fitted for running, and looks awesome (which isn’t any primary concern, but the Mica just looks a bit like it was designed for sending 8-year-olds to school). My concern with the Rab is that even with eVent, it may just heat up way too much when running anywhere other than the Scottish highlands and it doesn’t have the mechanical venting options you have here, although eVent has to rate higher than Membrain. The weights are also similar but I expect the Mica’s more crushable. What do you reckon? Which is going to best hack Australian conditions – which can vary wildly in a matter of hours – and really outperform? Re: the Super Mica, I can tell you that I’ve had zero concerns with its durability and breathability in pretty extreme conditions. It just so happens that in my testing above I wore the Super Mica while carrying a winter pack loaded with a Rab Summit Extreme “bivy,” and ascended ~4000 ft without any condensation buildup whatsoever and absolutely no wear. Agree that it looks less than rugged, but you probably need to accept that with anything that you’d purchase that’s less than 10 ounces in weight and exercise an appropriate amount of care. For my intended use, the Super Mica is a perfect fit. The myriad venting options would support it not being as breathable as eVent and I recognize that eVent is really unmatched in that regard. I guess it all comes down to your intended use. I purchased the Super Mica as a lightweight jacket with features that I could fully use for backpacking. In that regard, I’m extremely pleased. In your case, a pullover with an athletic cut may be more appropriate for your needs . . ..
Best of luck with your run. Do drop me a note after your run! Hey again – thanks for quick feedback! Ummed and Aahhed. Went with the Super Mica. I think the Rab has to be a mad bit of kit and will keep eyes peeled for either V2.0 or OMM’s eVent jacket later this year, assuming they will be more adaptable. I think that nanotech aside, anything is going to eventually get overwhelmed by hot sweatiness. My hunch is that the Demand is probably the bomb for near-Arctic adventuring, but with little time to fix a bad call the Super Mica does offer those options which mean you can adapt under pressure without having to stop and change every hour as you overheat and recool. I think… Really feel like I should have done an extra 10 hours running this week instead of investigating fibres!! Got a mad deal in the end. Your review (on top of a bunch of other conversations and reading) did actually help me decide in the end, so cheers for that. PS What you talkin bout? Black velcro overcoat and you’re catwalk as!!! Nice post and the most honest review of the Super Mica I’ve seen! I’m looking at getting this jacket (it’s light, durable-ish, pit-zipped and fairly WPB) and was wondering how you liked it when you weren’t wearing it? Does it pack into its own pocket and clip on to a pack like the original Mica? Does the wire brimmed hood pack well? While the Super Mica neither packs into its own pocket, nor has a clip for attaching it to something else, this hasn’t been a problem for me. I simply hold it by its hood so that it hangs freely and roll it from the hood down to the base of the jacket. It rolls pretty tight and can be easily shoved into the front pouch of my pack for easy access (or anywhere else for that matter). It’s not much bigger than a 12oz can of soda when rolled this way. The wire brim is easily rolled and really only retains its shape when over one’s head given the way it’s configured. It’s hard to explain, but it was well designed, IMHO, to provide structure only when worn (which is the only time when it’s needed). I actually roll mine in reverse: from bottom to top. It rolls itself into the hood and stays rolled up quite nicely. However, I did dedicate an extra UL ditty bag to it when I bought a 3-pack. I usually use this for late spring-fall mountaineering, but its so light I will also throw it in my school bag. I am looking into something a little more durable for winter treks though, just because I am paranoid about how the material will stand up to abrasion with a heavier pack and putting my arms down on rock. Overall the jacket does breathe incredibly well and it is totally waterproof, except at the cuffs as has already been mentioned. Its weight and packability are phenomenal, especially when you factor in features and effectiveness. If I had to buy a replacement right now, I would buy the super mica again. Im 190lbs. 6’3″ with long arms and the XL size fits me perfectly with room for a fleece layer or a medium thickness puffer layer underneath. I’m waiting on a replacement, but they seem to have sold out and are slow at making replacements. I am considering to buy this jacket for wind/rain protection when hiking. On my trips I usually start out with a 20kg backpack as we do not rely on food supply during our trips. On the picture it looks like you have a rather heavy backpack as well (other reviews usually feature daypack-hiking), so I wonder how the good durability of the jacket is. Your update on this after 2-3 years usage would be very appreciated! I’m still searching for the perfect jacket and realize that it may not actually exist. The biggest issues that I’ve had with the supermica is that the Teflon reinforcements will wear out over time — I had to remove mine after they became ratty after about ~1 year of use with a pack. In addition, the interior strata membrane ripped on one of my shoulders after another year of use. At this point, I’ve relegated this jacket to wet ‘training’ usage and have acquired several others for different situations. This is a very light jacket and, as such, needs to be treated carefully. With 20kgs of gear, I doubt that this jacket would last very long. You might be better suited getting a heavier duty, reinforced eVent jacket, given your pack weight.